In the heat of the early spring sun, after weeks of torrential rain, Rossi Navi launched Param Jamuna IV on Saturday. The 49 metre yacht is the first in the aluminium Prince Shark superyacht line penned by Enrico Gobbi of Team For Design. 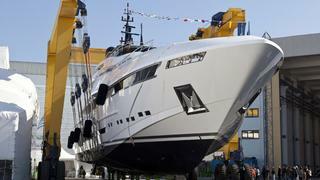 It is also the second launch of the season for the Italian yard following 48m Vellmari, also designed by Gobbi. The designer oversaw Param Jamuna IV’s styling, exterior design, layout and interior décor, while Arrabito Naval Architects took care of the engineering. She features modern, aggressive lines and a sharp and aerodynamic look. The effect is powerful and elegant at the same time. For the interior Gobbi has developed a style that balances modern Italian simplicity with an ethnic flavour. The choice of natural materials creates a play of light and dark, enhanced by the presence of marble. Great care has been given to the lighting design, which is tailored to enhance the different activities in different areas and enhance the space available. Kaleidescape is used for controlling the TV and entertainment system and a top-of-the-range WiFi network makes a video conference on the open sea a possibility. There are also a number of Apple systems onboard. With its lightweight aluminium semi-planing hull and superstructure, Param Jamuna IV offers a maximum speed of 23 knots and a cruising speed of 19 knots. Two MTU 12V 4000 M93L engines offer 2580 kW (3560 HP) each. The yacht has a maximum width of 8.8m, a maximum draft of 1.85m and accommodates 12 passengers and 11 crew members. She will be delivered to the owner by the end of May and along with Vellmari, will attend the Monaco Yacht Show in September. A second 49m yacht in the Prince Shark line, currently known as hull number FR028, has been ordered and is under construction at the yard. Delivery is scheduled for May 2014.